In many cities, particularly examples like Louisville that aren’t quite as far along on bike infrastructure as the usual velo-havens (Portland, Minneapolis, et al), you don’t have to look far to find bikes locked up outside businesses, but lacking a real bike rack. These bikes are usually latched to anything in sight: parking meters, trees, hand rails, exposed pipes. Some places will take the initiative and install a bike rack, or petition the city to have them installed. Most just sit around and do nothing. Apparently, the YMCA of Greater Louisville is one of the latter. I go past the Downtown Y nearly every day, and, without fail, there are always at least half a dozen bikes locked up to random objects within a 20 foot radius of the front doors. While the Y does have a couple bike racks tucked away somewhere inside of their huge parking garage—I couldn’t find them on a cursory look around the ground floor—this picture is a clear indication that they aren’t doing the job. If the YMCA, an organization whose mission is based on encouraging active lifestyles and healthy living, won’t take action on their own despite bikes strewn about left and right, there’s not much hope for places that don’t have a vested interest in getting people out of their cars. Why don’t more Louisville businesses get the hint that bike racks can be as important as a parking space? Only in the most traffic choked areas of the Bardstown Road/Baxter Avenue corridor can you find bike parking with any regularity, and it is still scarce considering how dire the auto parking situation is on a Friday or Saturday evening. Business owners in the Highlands or Bonnycastle wouldn’t scoff when a customer complained about the difficulty finding a place to park their car. So why, when I make a friendly request for a bike rack, do I so often get the cold shoulder? Bike parking is vital to business. While cyclists do spend bikes generate slightly less per capita vehicle, based on the average occupancy of vehicle trips, when visiting a business, when you consider that you can typically park as many as 15 bikes in the size of one typical parking space, area devoted to bike parking generates far more revenue than does space allocated to car parking. In fact a study in Melbourne, Australia found that each square meter devoted to bike parking generated 5 times the revenue of a square meter of car parking. What’s more, I’d venture a guess that the average cyclist is more concerned with buying local and supporting local businesses than your average driver. 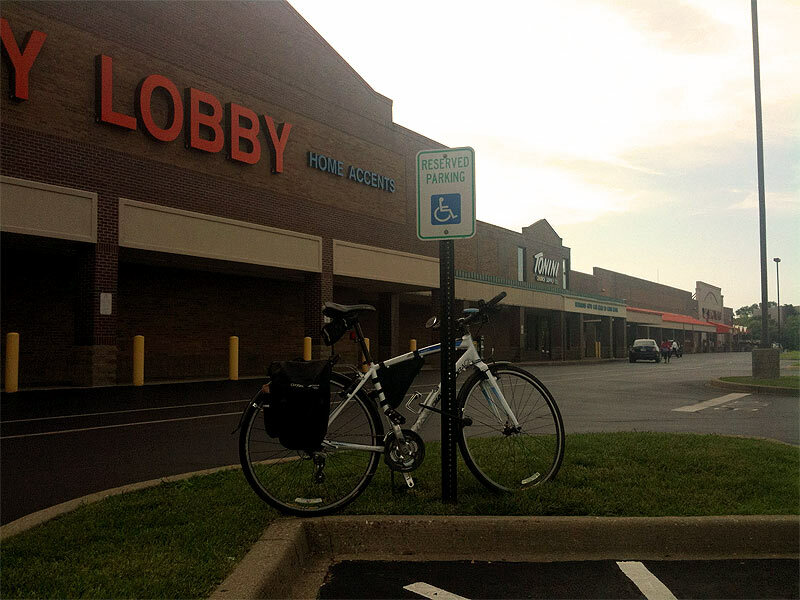 I mean, how many people bike in from Bullitt County to go to Wal-Mart? Since Louisville has run out of federal funds to supply bike racks upon request, and the “21st Most Bike Friendly” city has decided not to commit any local resources to expanding bike parking options. I think it’s time for local business associations to work with their members to make the city’s shopping districts more amenable to visitors on two wheels. In Washington, D.C., many of the local Business Improvement Districts have held competitions to design unique bike racks branded specifically for their districts. Incidentally, those that have done this are districts that I and many of my bike-riding friends frequent most often. Until Louisville businesses make this same connection, the city’s bike friendliness—and consequently the number of people who actually ride bikes—will continue to stagnate. It’s pretty obvious that, when available, bike racks are well-used. Just look at Midcity Mall on a Sunday afternoon, where bikes frequently spills into “scooter only” parking. Slugger Field has ample bike parking just where you expect it — right next to the entrance (although last time I was there, motorcycles had decided to take advantage of the free racks). And, as David Morse pointed out a few months ago, even the sprawling, suburban Target at Westport Road is surprisingly bike-friendly (http://cartky.org/node/588). While beggars typically cannot be choosers, we need to get picky about our bike parking requests. Perhaps worse than no bike rack at all, poorly-designed, poorly placed racks can be found in abundance across our city. 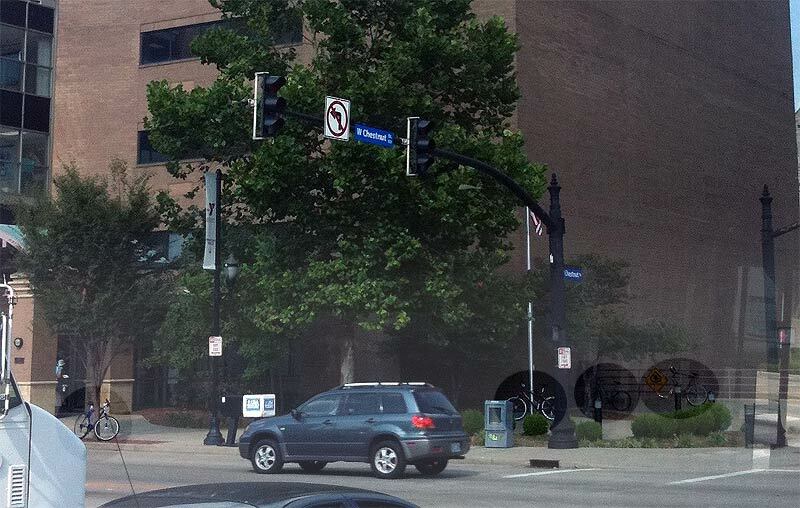 Consider the situation at the downtown library, which is heavily patronized by cyclists. There, two of the old, grid-style racks are placed flush with a concrete wall. Unless you’re riding a kid’s bike or have a really long chain, there’s no way to lock up. A popular, centrally-located hardware store in the Highlands has a bike rack — but it’s one of these gems: http://tinyurl.com/3ok8f8n (there’s a sign on their door that reads, “NO Bikes inside — please use bike rack.”). Iroquois Park has no racks at all (which, in a way, is kind of nice: the attendants typically let us bring our bikes inside the amphitheater). The “art bike rack” thing might be a sore subject. Several years ago, the Downtown Management District sponsored a contest like this, and now we have dozens of questionable bike racks scattered across our urban sidewalks. In some cases, the racks are useless. In others, they’re dangerous (since they block sidewalk access). Worse yet, the city and property owners don’t differentiate between a bad rack and a good rack. To them, a rack’s a rack. So, when a request comes in for additional bike parking (with capacity for more than 2 bikes and the ability to use a U-lock), that request is denied since there is already a rack in the vicinity. Enough complaining, though. I would like to see advocacy groups come up with a standard set of recommendations for installing bike racks in Louisville. For example, racks need to be placed in highly-visible, high-traffic locations, preferably under cover (no one likes riding on a wet seat), and off the sidewalk when necessary. Perhaps businesses who prioritize bicycle parking could receive the Office Gold Star of Approval and put them on the Bike Friendly Businesses list. One last thing. You mention that cyclists spend less per-capita than motorists. While I can’t argue with statistics, I do know that, since going car-free, we spend more money at locally-owned businesses than we did before. When I review our bank statement every month, it becomes pretty obvious that most of our money gets channeled to businesses that have the best bike parking. The Downtown YMCA recently removed bike parking for about 12 bicycles right in front of their door. One rumor I heard was that “the bicycles were getting stolen”, so management decided that rather than combat the problem by loaning locks from the front desk, or posting a sign instructing people in how to securely lock a bike, they’d just remove their most popular, green, healthy, and convenient parking. Sigh. And I’m not sure why you couldn’t find the bike rack in the parking garage–it is located immediately on your left when you enter from 2nd Street. @John S. – The bike rack in Google Street view is no longer there. According to Dave M, the Y actually removed it for some reason. @Dave M. – Dave, I’ve corrected my wording to say what I actually meant, that bikes generate less per vehicle (per trip) than cars based simply on higher occupancy for cars. The study estimates higher generated revenue based on the 1.2 people average occupancy, though I’d guess that when it comes to retail trips average occupancy is probably higher since people are much more likely to ride together to a restaurant, bar or shopping trip than they are to work. Regarding the YMCA bike rack, I think it may have been destroyed in a car accident at some point. I don’t know for sure, but I think I remember seeing it thoroughly mangled one day (back when I actually went to the Y). Interesting point about bike parking in the garage. When I’m in a car, I expect to have to drive around for a while looking for a place to park. If I can’t find a spot on the street, the infrastructure will eventually route me towards parking, whether I like it or not. When I’m on my bike, though, I could wander around all day looking for bike parking… or, I could just latch up to the flag pole out front. So, even though a garage has bike racks, it’s largely irrelevant since cyclists aren’t going to use them. @Eric Brown – Bike Parking is so much smaller than car parking, that wayfinding to it is a serious design issue. Think of if they put handicapped car parking spaces not always near the door, but at random places in a sea of non-handicapped parking. It would be infuriating and much less useful to its intended users. That’s the same obfuscation that happens when you install bike parking out of sight of the front door. The Y used to have pretty decent bike parking, albeit not enough. They had short term, easily found bike parking in front, and the dark, but covered and mostly monitored bike parking in the garage. They’re two different beasts though, and you can’t interchange long-term foul-weather medium-security bike parking with easy-to-use, short-term, convenient bike parking. Well, you can try, but people will justifiably complain – witness this article! The downtown Y has bike parking in the garage in an area that is covered and in sight of the garage attendants. That’s not bad. I think you need to look for another bad guy, or better yet, celebrate those that make the effort to accommodate us cyclists. i always lock my bike up to the object closest to the door, hopefully its a bike rack but if it aint, w/e. i dont see what the big deal is.